Our Destination Management and Incoming services offer you an incredible amount of original snow activities for your company to enjoy an unforgettable team building / incentive day in Granada and Sierra Nevada (Andalucia). It's important, when organizing such winter team building events, to keep in mind the importance of security, fun, challenge and learning. The group is divided into teams that compete against each other, rotating between the activities according to a predetermined schedule. The team effort is the determining factor when it comes to the final victory. Snowraft: A race between two teams, in which the participants slide down the slope on a giant rubber ring. The one who crosses the finish line first wins. 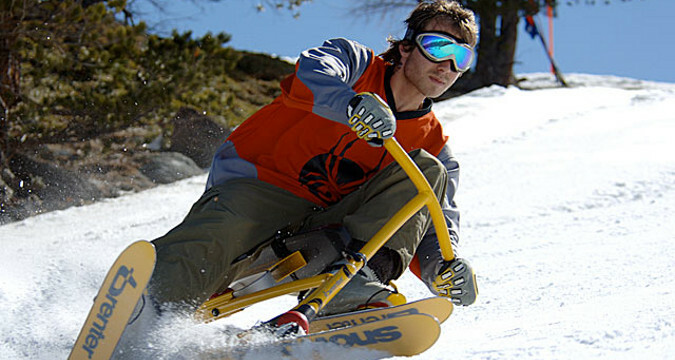 Snowbike: Straightforward activity in which the participants compete by completing a slalom course on a snowbike. Snow body board: A very entertaining activity with no technical difficulties. The participants have to complete a course in the shortest time possible. Organization, coordination and supervision of the activities. The whole group enjoys practice and a game of golf in the snow. allegoric emblem of the event or an illustration of the corporate image of the company for which they work. There is also the alternative of constructing snow sculptures. There will always be one member of each team working on the snow sculpture. The remaining four team members compete against the other teams in the various activities. The team that wins each activity obtains material to use for building the sculpture. Each time that the team obtains new material, they take it to the “construction site” and decide which 4 members to take part in the subsequent activity and which members to work on the design in the snow. Each team will rotate amongst the activities according to a predetermined schedule. After the teams have completed all exercises and finished the construction work in the snow, a judge will assess the creations and elect the winning piece of art. Giant skis: The teams complete a technical circuit “onboard” a pair of giant skis. The challenge is to maintain their balance... The time it takes them to complete the circuit also counts. Snow bob: entertaining activity using sledges that are easily steered. The teams compete by completing a beautiful circuit as fast as possible. Snowshoes: After learning how to put on the snowshoes, the participants complete an easy, guided circuit, at the end of which they have to pass a little test. Mounting and dismantling of the structures used in the activity. Our snow games incentive and teambuilding activities are ideal for groups of 20 to 150 persons looking for original winter fun in Southern Spain.